(1) The role of atmospheric dynamics in climate prediction and change. In particular, the DynVarMIP output request will allow for a first complete assessment of atmospheric momentum and heat transport in CMIP climate models, including the heat and momentum transport associated with subgrid scale boundary layer processes and parameterized gravity wave fluxes. (2) Stratosphere-troposphere coupling and its role in surface weather predictability. The focus is on sub-seasonal to seasonal (S2S) timescales, where stratospheric processes appear to be important. A goal is to take advantage of ensemble hindcasts by the forecast systems within the S2S project. The workshop aim is to bring together the climate change and seasonal prediction communities to focus on related questions on (for example), atmospheric teleconnections, blocking events, storm tracks dynamics, and interactions between the stratospheric polar vortex and the tropospheric jets. To this end, we call for analysis of the CMIP experiments, including the DynVarMIP diagnostic request, and of the S2S hindcast experiments. The workshop will include discussion to facilitate coordination of future analysis efforts. Travel support for Early Career Scientists (ECS) and participants from underrepresented countries has been provided by the IAMAS, US NSF, and WMO (WCRP/SPARC). ECS’s include students, postdocs, and non-tenured faculty with in approximately 8 years of their PhD. Invited speakers and discussion leaders will introduce presentation topics and stir discussion. Please note that due to the limited size of the workshop we can only accept 1 oral presentation request per participant. A proposed travel budget. In many cases, we may only be able to provide partial support. Please indicate if other funds may be available to supplement your travel. (Only for PhD students) A letter of support from your advisor. Please attach all documents together in one PDF; the letter of support from your advisor can be sent separately. Space is limited to approximately 80 participants. All participants must be registered. Information on registration (and registration fee) will be included here in due time. 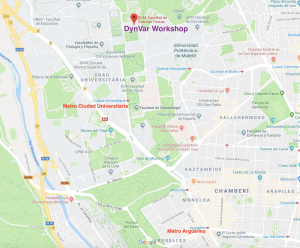 The joint DynVar & S-RIP meeting will start on Tuesday 22 October 2019 and finish on Friday 25 October 2019. More detailed program will be available later. Ed Gerber (ude.u1555898473yn.sm1555898473ic@re1555898473breg1555898473) (New York University, USA), Elisa Manzini (Max-Planck-Institut für Meteorologie, Hamburg, DE), Amy Butler (CIRES/University of Colorado and National Oceanic and Atmospheric Administration, Boulder, USA), Natalia Calvo (Universidad Complutense de Madrid, Spain), Andrew Charlton-Perez (University of Reading, UK), Daniela Domeisen (ETH Zürich, CH), and Alexey Karpechko (Finnish Meteorological Institute, Helsinki, FI). The workshop will be held at the Facultad de Ciencias Físicas (Physics’ building) of Universidad Complutense de Madrid. Within the Physics’ building, the workshop is located in room: Magna 2. Physics’ building address: Plaza de Ciencias, 1, 28040, Madrid. The closest Metro station to the workshop location is “Ciudad Universitaria”. It takes about 12 min. to walk from “Ciudad Universitaria” Metro station to the Physics’ building. Close to the venue, hotels are located in Argüelles area, in the vicinity of the Metro station “Argüelles”, also indicated in the map. From the hotel area to the Physics’ building you can either walk (about 35min), or take the metro. A list of hotel will be provided in due time. Participants will be responsible to make their own reservations. The Madrid-Barajas International Airport is strategically located just 12 km away from the city centre. It has four terminals (and a satellite terminal, T4S), and it is possible to transfer between terminals using buses or trains that are free for all passengers. Taking the Metro at the airport is probably the quickest and cheapest option to reach the Physics’ building at UCM. It is easy to use from any of the terminals. There are two stations at the airport: Aeropuerto-T1-T2-T3 and Aeropuerto-T4. The entrances are located on the first floor of terminal 2 (T2) in the connection corridor, and on the first floor of terminal 4 (T4), respectively. Recommended route (~30 min): Take Line 8 (pink, the only possible line from the airport) to Nuevos Ministerios. Then, transfer in Nuevos Ministerios to Linea 6 Circular (grey), Platform 1, towards Ciudad Universitaria. Origin: Aeropuerto T1 T2 T3 or Aeropuerto T4. There are several types of tickets you can buy. An additional charge, called a “Servicio Especial”, is required to enter or exit any of the Airport Metro stations. A Multi Public Transport Card (MULTI card) is needed to load the tickets. The MULTI card can be purchased from the ticket machines at any Metro Station at a cost of 2.5€. However, it is free if you buy a Tourist ticket. Travelling to the city center by taxi is the most convenient but also the most expensive option. To take a taxi, you must go to the designated taxi stop located at the exits of each one of the terminals. The taximeter shows the price of your ride. We therefore recommend that you make sure prior to the beginning of your ride that the driver has switched the taximeter on, indicating the basic fare. The price for a taxi ride from the Barajas airport to the central area Madrid is a flat rate (currently 30€) one-way; this includes rides to the University or hotels in the Argüelles area. The luggage is included for any tariffs. We gratefully acknowledge funding kindly provided by the Universidad Complutense Madrid, Instituto de Geociencias, the National Science Foundation (NSF), the World Meterological Organization (WMO), the Stratosphere-troposphere Processes And their Role in Climate (SPARC) project of the World Climate Research Programme, and the International Association of Meteorology and Atmospheric Sciences (IAMAS) of the International Union for Geophysics and Geodesy (IUGG). Please remember to send us a quick email with your feedback to gro.e1555898473tamil1555898473c-cra1555898473ps@ec1555898473iffo 1555898473. Thanks!